With a Karaoke Machine. The Stanhope Arms is a pub in South Kensington. Kristen Ann Carr Fund Benefit Concert. The fund is dedicated to fighting Sarcoma. Joe Ely and Terence Trent D'Arby guest. Joe Ely plays guitar and sings on "Lonesome Valley" and "Settle For Love". Terence Trent D'Arby plays guitar and sings on on "Many Rivers To Cross", "I Have Faith In These Desolate Times", "Jole Blon", and "Jumpin' Jack Flash". Sadly, this show is perhaps best known for the Terence Trent D'Arby "event". After D'Arby was booed Bruce admonished the crowd: "Terence Trent D´Arby... need I remind some of you rude motherfuckers that everybody onstage is my guest?". With Wolfgang Niedecken And His Leopardefellband. 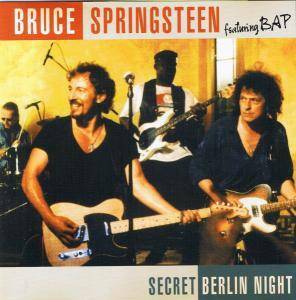 One of the numerous "Hungry Heart" takes recorded during this performance was officially released on the Hungry Heart CD EP as "Hungry Heart [Berlin '95]" later the same year, although this just featured Bruce's live vocals from the Eckstein show laid over the original 1980 E Street Band instrumental tracks! First ever Springsteen performance of "Knockin' On Heaven's Door" and first performances in Europe of "Down The Road Apiece", "Highway 61 Revisited", and "Honky Tonk Women", and first ever Springsteen performance in Germany of "Jumpin' Jack Flash". 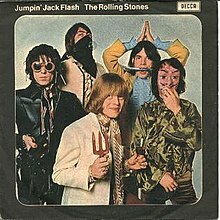 "Jumpin' Jack Flash" is a song by English rock band the Rolling Stones, released as a single in 1968. Called "supernatural Delta blues by way of Swinging London" by Rolling Stone magazine, the song was perceived by some as the band's return to their blues roots after the baroque pop and psychedelia heard on their preceding albums, Aftermath (1966), Between the Buttons (1967) and especially Their Satanic Majesties Request (1967). One of the group's most popular and recognisable songs, it has featured in films and been covered by numerous performers. Written by Mick Jagger and Keith Richards, recording on "Jumpin' Jack Flash" began during the Beggars Banquet sessions of 1968. Richards has stated that he and Jagger wrote the lyrics while staying at Richards' country house, when they were awoken one morning by the clumping footsteps of his gardener Jack Dyer walking past the window. Surprised, Jagger asked what it was and Richards responded: "Oh, that's Jack – that's jumpin' Jack." The lyrics evolved from there. Humanities scholar Camille Paglia speculated that the song's lyrics might have been partly inspired by William Blake's poem "The Mental Traveller": "She binds iron thorns around his head / And pierces both his hands and feet / And cuts his heart out of his side / To make it feel both cold & heat." Jagger said in a 1995 interview with Rolling Stone that the song arose "out of all the acid of Satanic Majesties. It's about having a hard time and getting out. Just a metaphor for getting out of all the acid things." And in a 1968 interview, Brian Jones described it as "getting back to ... the funky, essential essence" following the psychedelia of Their Satanic Majesties Request. In his autobiography, Stone Alone, Bill Wyman has said that he came up with the song's distinctive main guitar riff on a piano without being credited for it. In Rolling with the Stones, Wyman credits Jagger with vocals, Richards with guitar and bass guitar, Brian Jones with guitar, Charlie Watts with drums and himself with organ on the track with producer Jimmy Miller adding backing vocals. According to the book Keith Richards: The Biography by Victor Bockris, the line "I was born in a crossfire hurricane", as written by Richards, and refers to his being born amid the bombing and air raid sirens of Dartford, England, in 1943 during World War II. Aretha Franklin : In 1986, the song's title was used for the Whoopi Goldberg film Jumpin' Jack Flash. In addition to the Rolling Stones' version of the song, the film features Aretha Franklin's cover version for which Ronnie Wood and Richards played guitar, but Franklin played piano. This version is characterised by influences from the popular black music scene. Both the Rolling Stones' and Franklin's versions are on the film's original soundtrack recording. 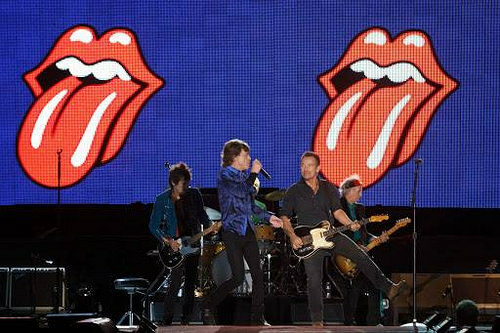 Bruce joins The Rolling Stones on the World Stage at the "Rock in Rio" Festival, performing "Tumbling Dice" together. 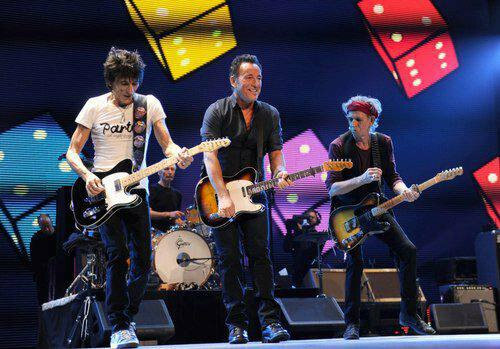 Bruce's last public action in 2012 is a scheduled appearance as a special guest with The Rolling Stones on their 50th anniversary tour in Newark. A somewhat starstruck Bruce shares lead vocals with Mick Jagger. This is the first time Springsteen has played "Tumbling Dice", from the Rolling Stones' 1972 album Exile On Main St.
Springsteen attends the fourth Annual Rock And Roll Hall Of Fame ceremonies. The night's inductees are The Rolling Stones. Bruce jammed with an all - star band, including The Stones.